Dental implants (a.k.a. “tooth implants”) are metal alloy “posts” that are placed where the roots of a natural tooth would be/would have been. This tooth implant post (often a titanium alloy) then undergoes a process called “osseointegration” in which the post actually fuses naturally with the jaw bone, creating a very strong and often permanent base to attach a crown or denture to. This integration process is a huge benefit of dental implants in that the tooth implant prevents bone loss and atrophy that happens when a tooth or teeth are missing. You may have noticed when people have their natural teeth removed and use dentures, their jaw bone starts to deteriorate and their skin loosens around their mouth and jaw. Dental implants are not just used for individual dental crowns. They can also be used to replace multiple missing teeth. A modern implant dentistry procedure that is currently used as an alternative to traditional dentures is placing a series of dental implants and permanently affixing a denture to the them. This then allows for natural looking dentures to be more secure and permanent and also more naturally functioning as one does not need to worry about their dentures falling out when eating, talking laughing, etc. This tooth implant procedure is popular even for that reason alone as growing old does not now automatically mean that you will have embarrassing denture moments. Is IMPLANT DENTISTRY Right For You? Dental implants are a phenomenal emerging restorative and cosmetic dentistry procedure and Dr. Brett Felton and the Felton Dental Care team are proud to offer such a life-improving procedure to the wonderful people of Missoula. We will work with you to determine if implant dentistry is the best solution for your unique situation. If it is, once the diagnosis and treatment plan are completed, we then refer patients to a highly skilled oral surgeon who will perform the dental implant procedure. 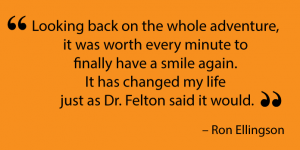 After the dental implant has healed, patients come back to Felton Dental Care for the placement of the dental prosthesis (artificial tooth). Dental implants may just be the alternative you’ve been looking for to traditional braces, or, it may be the best way to restore a broken, damaged or missing tooth. Call, text, or contact us using the form below to learn more about implant dentistry or to schedule a dental implant consultation. We look forward to assisting you!